Wahoo already makes the KICKRs, which are among our favourite turbo trainers. If you don't know what a turbo trainer is, you're clearly no MAMIL: it's a device that you attach to the back wheel of your bicycle to turn it into an exercise bike, for training purposes. 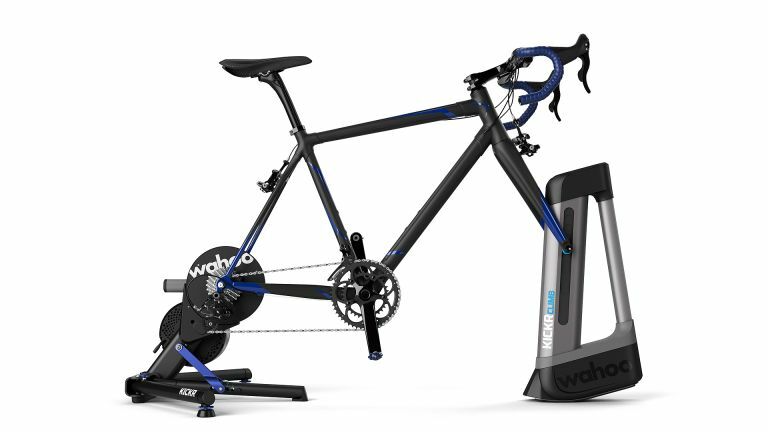 A turbo trainer like Wahoo's KICKR Snap holds the bike upright and acts as a brake, with resistance either dialled in by you, or changing dynamically to simulate a ride, using apps such as Zwift. UPDATE: Hey, now we have an actual Wahoo KICKR review, with Wahoo's Climb and Headwind (don't ask) accessories thrown in for good measure. Now, the brand, which is a supplier to the all-conquering Team Sky, is quite literally taking it to the next level with the KICKR Climb. Used in conjunction with a KICKR turbo trainer, the Climb doesn't just apply resistance to the back wheel, it actually raises your front wheel to more fully simulate climbs. At this moment, anyone reading this who's not interested in cycling will be yawning and moving onto something else, but cyclists will be yelling, "Oh my god, this is the most outrageous idea ever! Where can I buy one?" That's because hill riding is not simply a matter of overcoming gravity; to train properly for it involves using muscles and riding positions that you simply wouldn't be able to use with a bike that's level. “The world we ride in isn’t flat, which is why we believed the indoor riding experience on the KICKR should follow suit,” says Wahoo's excellently-named Fitness CEO Chip Hawkins. “We’re proud to quite literally take structured climbing workouts and virtual course rides to the next level." Yeah, I already did that joke thanks, Chip. Existing KICKR and KICKR Snap owners will have to upgrade to a new model of the turbo trainer that can cope with pivoting your back wheel as the Climb raises the front wheel. It can be set to a specific gradient, or respond to workout and virtual course data from apps in real-time. The full range of the Climb allows for ascents of up to 20% gradient, and it can also dip the front of your steed to mimic descents down to -10%. Before you know it, you're Eddie Merckx. Apps supported include Zwift and TrainerRoad, or you can use routes ridden and stored on Wahoo’s ELEMNT bike computers. Alternatively, you can use this handlebar-mounted control to manually adjust the gradient. The new KICKR and KICKR Snap trainers cost £999.99 and £499.99 respectively. The Climb 'supports a wide range of modern hub configurations, including quick-release, 12x100, 15x100, and 15x110 thru axle hubs' and will cost £449.99 when it launches this autumn.